The buildings of Manhattan tends to invoke a particular feeling. Classic beauty and form. Iconic structure. Urban elegance. Every so often, however, a new building rises in the skyline that gives Manhattan a new dimension. A tower that doesn’t take away from its predecessors but instead informs where the city has been and where it is going in the future. To look at the 42-story, 460-foot-high tower at 685 First Avenue is to see all of that. Sleek, modern design that signals a step forward in Manhattan and New York living without denying the architectural roots from which it came. Looking across the East River from Queens, you would be hard-pressed not to notice it amongst its neighbors and yet it never seems out of place. Designed by Richard Meier & Partners Architects, 685 First Avenue is located right between East 39th and East 40th Streets on First Avenue, just south of the United Nations Headquarters. The location gives it stunning views of the East River and beyond out its east-facing side and also provides a welcome piece to the skyline puzzle that fits perfectly when viewed from Hunters Point across the way. A collaboration between Richard Meier & Partners Architects and East River Realty Development, this all-black glass building is the tallest that the architecture firm has ever designed in New York City. The notion behind the sleek design was to create something iconic but ultimately unique to Midtown. It’s innovative but minimal. Timeless but influenced by what came before it. The idea was to create a “facade as skin” texture for the exterior of the tower. The incisions in the wall created modular subdivisions that articulate to form balconies and sharp corners. At the 27th and 28th floors, the building features a clear cut-out meant to create a division between the two halves and provide context to the neighboring structures. And while that skin might be perceived as solid black from the outside, the glass is transparent from the inside, creating a simple-but-beautiful contrast. Along the street below, the building promotes activity thanks to a bustling retail scene along First Avenue and a grand lobby entrance for residents. The oversized lobby features light materials and huge glass windows, which help cut down on the disconnect between interior and exterior spaces. It’s modern and open while also remaining elegant. Inside this sheer tower, you’ll find 408 rental units that run from the third floor up to the 26th. From there, 148 condominium residences ranging from one bedroom all the way up to four bedrooms starting on the 28th floor and rising all the way to the 42nd. Each condo unit is meticulously designed but never overly complicated. Classic white, pale grey, and warm earth tones complement the wood floors, stone features, and floor-to-ceiling glass windows. Layouts are open and meant to draw your attention to the views outside and light that pours in. Because the glass is opaque to the outside world, there’s never any need to worry about privacy. It comes standard. Smart home Crestron automation system offers the ease of living that lets you truly relax. You can control lighting, window shades, and temperature from in-unit touchscreens. You can also control everything from your tablet or smartphone. Pre-wiring comes standard to make it simple to hook up speakers and televisions for 360-degree entertainment. Kitchens come well-appointed with white marble and stone islands and backsplashes. Gaggenau appliances scream luxurious but never overwhelm the rest of the room. The airy space is complemented by soaring ceilings that rise more than nine feet in most units and up to 20 feet in some duplexes. No matter the residence, the kitchen comes complete with radiant wood floors. Bathrooms continue the same theme with white marble walls and Blue de Savoie stone floors. Rooms are spartan and open but maintain a heightened luxury that doesn’t fade. Duplex residences include special standard features including freestanding tubs, staircases with solid wood steps. Some duplexes also double the height of the great room, offer expansive terraces, and provide private elevator access. The living experience at 685 First Avenue Residences isn’t complete until you’ve considered the various resident amenities included. More than just features meant to impress, they constitute an experience to be appreciated. That experience begins when you drive your car down the cobblestone ramp into the underground parking garage where you’ll be safe and secure with a direct entranceway to your residence. The grand lobby is watched over 24 hours a day, adding to that peace of mind. On the second level, residents will find a selection of top-notch amenities waiting for them. That includes an indoor swimming pool and fitness center for when you want to work up a sweat. There’s also a game room and lounge for when you’d rather take it easy and unwind. There’s even a private dining room for when a special occasion calls for more than dinner in your residence. And if you’d like to really sit back and relax, recline in the 12-seat screening room with built-in stepped seating. No matter which amenity space you’re using, they’re all decorated with custom details and warm tones to make you truly feel at home. One of the great things about 685 First Avenue Residences is that while the living experience is enough to keep you inside, you won’t want to because the neighborhood is alive with things to do and experience. The location gives you easy access to all forms of transportation, including water taxis, Grand Central Station, and even the East 34th Street Heliport. Or you can stay local and take a stroll around the East River Waterfront Esplanade. Head north and you’ll run right into the gardens and historic brownstones that make up Tudor City as well as the awe-inspiring United Nations complex. When it comes to dining out, the area is among the best in the city when it comes to selection. Smith & Wollensky, Cipriani, and Kajitsu are just some of the restaurants of varied cuisines you’ll find nearby. Looking for a stiff drink? Head to The Campbell, Tavern on 51, or La Biblioteca for the full experience. If you’re looking for the latest fashions, Saks Fifth Avenue, Dover Street Market, and Gucci are all well within reach. And if culture is what you’re after, it’s easy enough to experience places such as New York Public Library, Bryant Park, and Japan Society. If your curiosity is peaked, don’t wait too long to act on it. Quite a number of residences are available at 685 First Avenue. 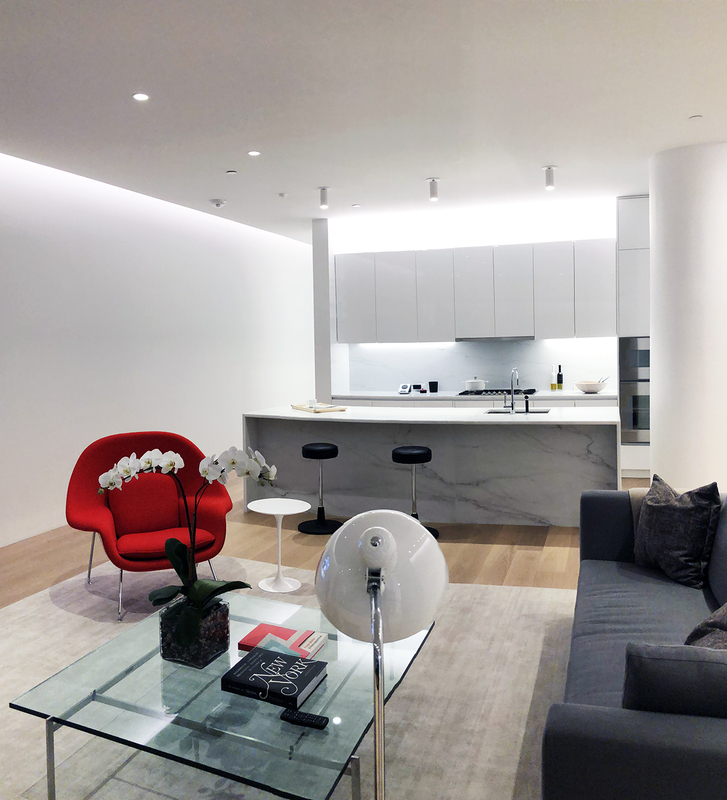 They run the gamut, from a 760 square-foot, one-bedroom asking $1,495,000, all the way up to a four-bedroom duplex with 2,984 square feet of interior space asking $8,100,000. Considering the structure’s design, it’s stunning location, and the high quality of the residences and amenities, it’s hard to imagine any of those last few places will remain available for very long.